The BBC is the most trusted TV news brand, followed closely by Fox News and PBS, according to an analysis created for Research Intelligencer by Brand Keys. The analysis, which draws from the 2018 “Customer Loyalty and Engagement Index,” examines 1,287 brands across 150 categories to determine how much “trust” contributed to each brand’s engagement and market success. 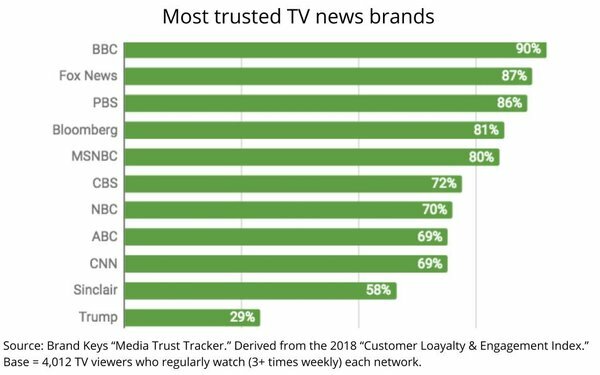 For the TV brands analyzed here, 4,012 viewers rated broadcast and cable brands that they watch regularly (3+ times per week) to determine how much trust those brands engendered. As President Trump has assailed news (of all varieties) as “Fake News,” and more recently, “the enemy of the people,” Brand Keys was interested to see how much “trust” viewers actually had in the President, versus the TVs brands. President Trump was rated with an overall 29%, less than a third of that attributed to the BBC, and half that of local news broadcaster and avowed Trump supporter, Sinclair Broadcast Group. The next wave of the Brand Keys Media Trust Tracker will measure newspapers. Robert Passikoff is founder and president of Brand Keys Inc.